Today, I’m off to Atlanta to take another of my board exams tomorrow. I’ve been crazy nervous/freaking out for about a week now, and I’ll be so relieved when it’s over. More stress = more baking! 😉 As I was running yesterday I decided to take a break from stressing over my exam and think up something delicious to make for breakfast. I had just bought some spelt flour at my last trip to Kroger and decided to make some healthy spelt pancakes. I also had some strawberries that were getting super ripe, so I decided to incorporate those into the pancakes as well. I don’t have much experience with spelt flour so I went to google looking for a recipe. For those of you that don’t know, spelt flour is a grain in the wheat family. It’s been cultivated for centuries and has a nutritional profile similar to whole wheat flour but with more nutrients. It has a nice nutty, slightly sweet flavor. 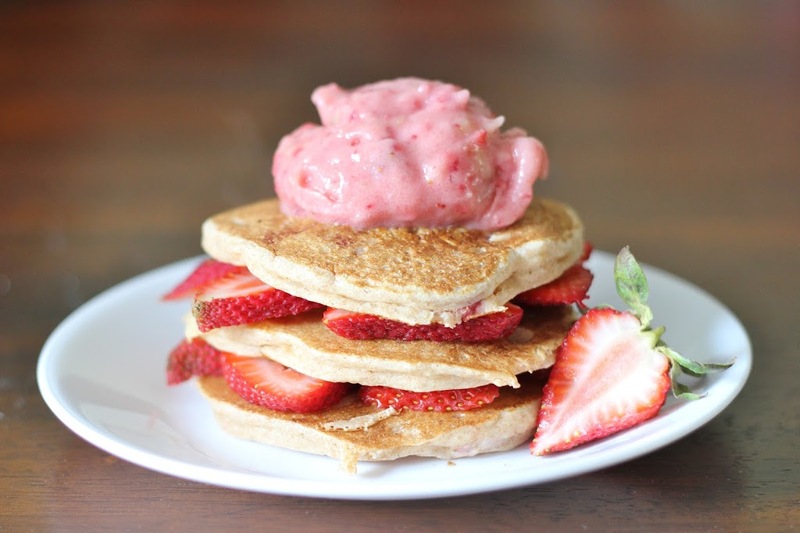 I found a recipe that looked like a good base start and then I stumbled upon strawberry pancakes topped with strawberry banana smoothie — what?!? Why didn’t I think of that? 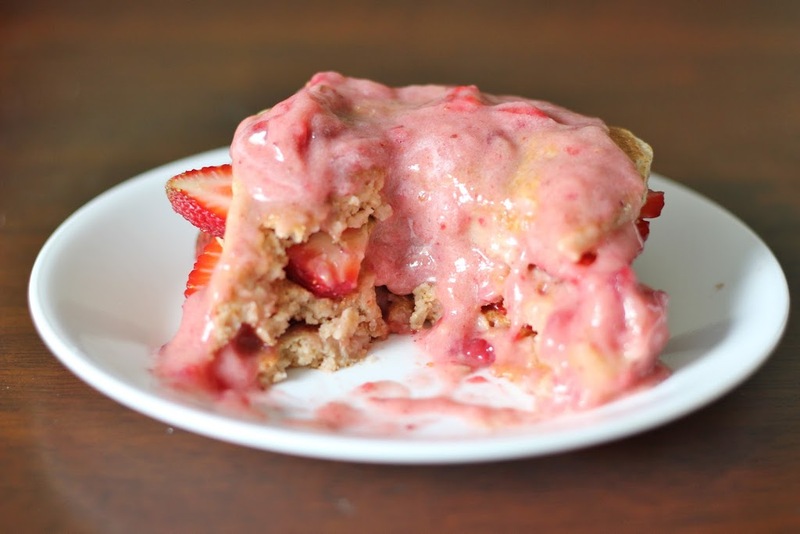 It’s like strawberry shortcakes with ice cream, except for breakfast and it’s healthy! The best of both worlds =). You’ve got to try this! It’s pretty much the best breakfast ever…except maybe chocolate gravy and biscuits. And if you don’t like smoothies (gasp! 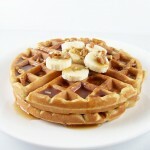 ), they’re equally good with a little whipped cream or maple syrup. Enjoy! And don’t forget to tell your dad Happy Father’s Day! I’m not gonna lie – my dad is pretty awesome! =D The older I get the more I realize just how awesome my parents are and just how lucky I am. And while I know this isn’t necessarily a manly recipe, he happens to share my love of ice cream so I think he’d enjoy it too. 1. Combine dry ingredients in a bowl, then add wet. Mix, but donâ€™t overmix. Gently fold in chopped strawberry. 2. Cook in nonstick skillet, on medium heat, flipping each pancake once. 3. 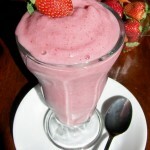 Combine frozen banana and strawberries in blender and puree until smooth. 4. 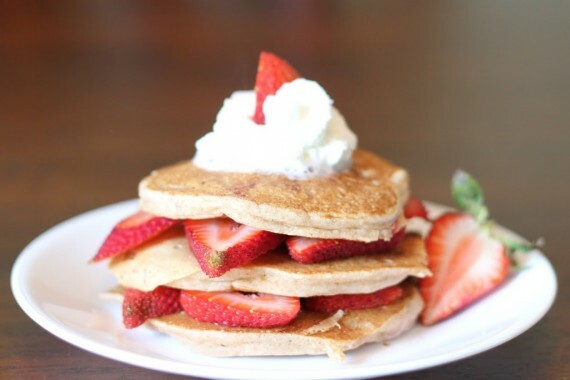 To assemble, layer pancakes with sliced strawberries and top with strawberry and banana mixture. Makes 3 small/medium sized pancakes, 1 serving.